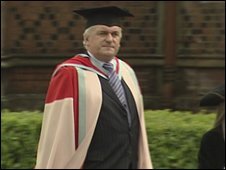 Former prime minister Tony Blair and former taoiseach Bertie Ahern have received honorary doctorates from Queen's University, Belfast. 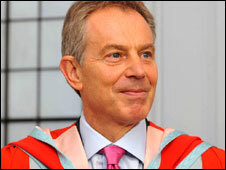 Mr Blair appeared by a pre-recorded video link message, while Mr Ahern accepted his degree in person. They both received law doctorates for distinction in public service and their roles in the peace process. It marks the start of a two-day conference, led by former talks chairman, George Mitchell, at Queen's. The joint initiative with Georgetown University is examining the lessons of the Northern Ireland peace process and how it can help other trouble spots around the globe. "I am sorry I can't be with you in Belfast. Retirement, as I have discovered, seems to offer no respite from work," said Mr Blair in his video link message. "One of the joys of politics is the way it throws people together in a haphazard way - the electorate decides who you work with. "And as prime minister, I was gifted with a taoiseach whose friendliness and good humour was matched by his commitment to building a new future for Northern Ireland - a future it needed and deserved." Mr Ahern, speaking at the older of Northern Ireland's two universities, said: "I am particularly pleased to be sharing this day with my great friend and colleague, Tony Blair. "I'm sorry Tony cannot be here in person, but from our recent conversations I know how much he too values this recognition of the role he played in bringing peace to Ireland. "At our first meeting as heads of our respective governments, we knew we faced enormous challenges but we knew too that the prize of peace would be a great one." Other special guests at the conference include Secretary of Secretary Shaun Woodward, South African Nobel Laureate Desmond Tutu, the former first and deputy first ministers Lord Trimble and Seamus Mallon as well as former Irish president Mary Robinson.